The median income for a married couple with kids in Seattle is now $161,000. For any family on a modest budget, Seattle has become an increasingly difficult place to live, and many have left. That’s not news to anyone. The number of Seattle families with an income of at least $200,000 is now greater than the number making less than $50,000. That’s the new normal here in the Seattle bubble, where the median income for family households — in other words, half make more and half make less — hit $121,000 in 2017. That figure has increased by 22 percent since 2010, after adjusting for inflation. You may wonder how any family could scrape by on less than $50,000 in the city these days, but there were more than 25,000 that managed to do it last year. Even so, they were easily outnumbered by those families at the other end of the financial spectrum. Fully one in four Seattle families — that’s around 38,000 households — reported income of $200,000 or higher. 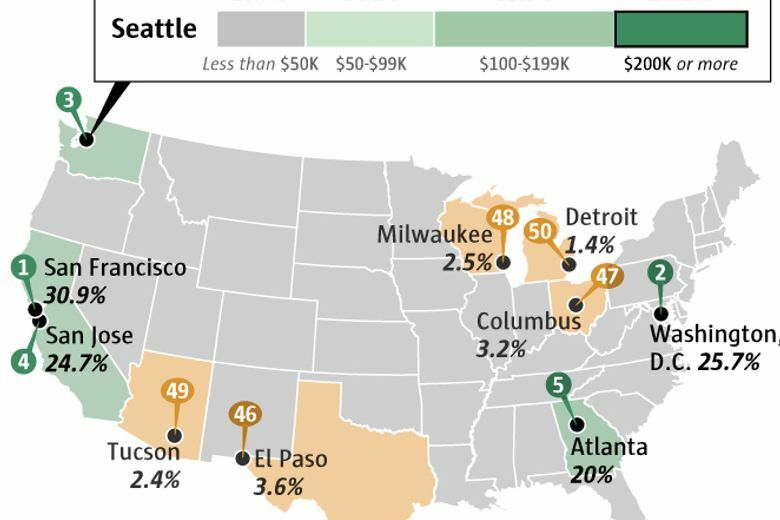 Among the 50 largest U.S. cities, Seattle is one of just three where family income is so heavily skewed toward the top. The other two are the usual suspects when it comes to exorbitant incomes: San Francisco and San Jose, California. Even in Portland, which is demographically similar to Seattle in many ways, the number of families making less than $50,000 is more than double the number making $200,000 or higher. In Portland and other “peer” cities to Seattle — Denver, Washington, D.C., and Austin, Texas — more than a quarter of families get by on less than $50,000. In Boston and New York, more than 35 percent do. A word on terminology: The Census Bureau defines a family as a household with two or more people related by birth, marriage or adoption. Seattle is home to about 151,000 families, making up slightly less than half of all the city’s households. About 71,000 of Seattle’s family households are married couples without children, or whose children are older than 18. Another 47,000 are married couples with children under the age of 18. Then there are about 16,000 households with a single parent of a child under 18 — 70 percent of these households are headed by a woman. The remainder — about 18,000 households — are some other family configuration. Between these different types of families, incomes vary widely. Of course, that’s partly because married-couple families typically have two breadwinners, unlike many single-parent households. But the difference in incomes is more dramatic than you might think. For married couples with children under 18, the median income in Seattle was $161,000 last year. For single-mom households, the median was just $36,000. Over on the Eastside, in Bellevue, 32 percent of families have a household income of $200,000 of higher. Of the more than 600 cities included in the census data, that ranks 15th highest. But if you head to our metro area’s main cities to the north and south, it’s a very different picture. In Tacoma, just 6 percent of families make that much, and in Everett, just 4 percent do.